Layla was my last child. It doesn't seem two minutes ago that I gave birth to her yet now she is a fully fledged little person, no longer a baby. She walks, talks, feeds herself and rarely uses her pushchair anymore. My youngest daughter took her last steps towards independence the other day when she said goodbye nappies and hello knickers, that's right completely potty trained, day and night. Potty training has definitely been interesting and all of my children have been so different with their approach so I just wanted to share with you 5 easy tips to make the experience better for both parent and child. * They know when they have got a wet or dirty nappy. * They might tell you when they are weeing or pooing, so they have good communication skills. * They may be drier for longer periods of time. Now this might be a good time to start trying but this doesn't necessarily mean that they are ready. My first tip. 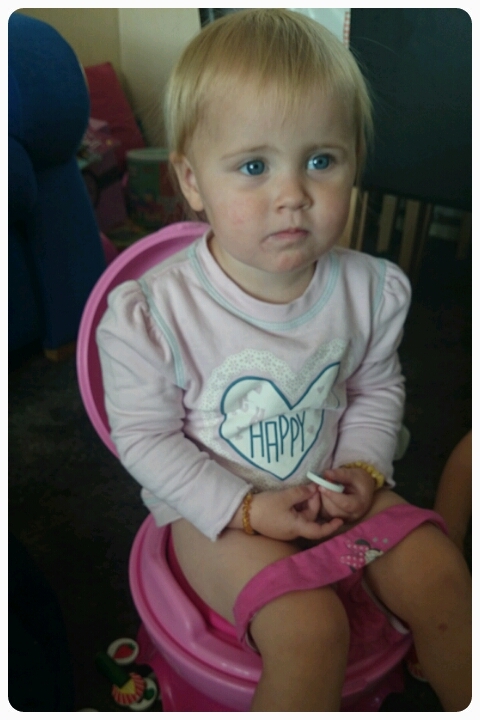 Buy a potty and I suggest a toilet seat too, let your child try them out, sit on them with clothes on, get used to the idea of what they are. Although don't do as my husband did and let them wear them on their head like a helmet!! My second tip, expect accidents. Being dry won't happen over night so have lots of spare pants/knickers at the ready. Be prepared to put the nappy back on. I've seen lots of sites telling you that once the nappy is off you can't go backwards but sometimes trying to persevere can do more harm than good, stressing out both parent and child. If your little one just isn't grasping the concept of weeing on a potty, don't force the issue, try again in a month or two. It took me three attempts with Layla, third time round she was dry within a week. Onto tip number four, try to get into a routine. I found sitting mine on the potty when they get up, eat a meal, go to bed really helped. Repeating reinforced just what they were doing. The fifth and final tip is the most important, stay calm! No matter what happens it is important not to get angry. Praise the good and let them know that accidents happen, it isn't a bad thing, explain that it is all practice. Don't worry about what other children are doing, remember each child is different and they will do it when they are good and ready. What are your best potty training tips?? How old is Layla? My toddler has just turned two but I don't think he's ready yet, he tells me if he's done a poo but I don't think he realises if hes wet. We're not in any rush though!